There are many parts of a circuit board—the laminate that creates the foundation for the entire board, the copper traces that do the work, the solder mask to make soldering easier, and the silkscreen to convey ideas, words, and images to the end user. The finish of a board, which is sometimes overlooked, is the interface between the board and the components that make the board function as desired. To the untrained eye, there is not much variation in how different finishes look or perform on a circuit board, but, with time and experience, subtle and not-so-subtle differences emerge. There are several general goals that all finishes try to accomplish to varying degrees. First, they provide a more solderable surface than bare copper. Second, they reduce oxidation of the exposed pads. Third, they lengthen the shelf life of the circuit boards between manufacturing and assembly. While corrosion must be taken into account when using finishes, there are other factors to consider as well—the largest being planarity. Some finishes create smooth, flat surfaces that surface-mount devices sit on with all leads or solder points either sitting directly on the finish or very close. Other finishes are uneven and create rough surfaces for surfacemounting devices. While this is not an issue for through-hole devices and even large surface mount devices, the irregularities can cause open solder joins or misalignment for very fine pitch or BGA surface mount devices. The application of finishes uses methods similar to adhering a coating of metal to another type of metal. Dip coatings are popular due to their ease of application and generally low cost. As can be inferred from the name, a dip coat is where the PCB is dipped into molten solder or some other substance, before being removed and the coating planarized. 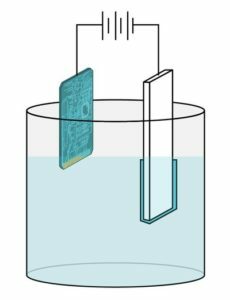 Immersion plating is a subset of dip coatings, but relies on a chemical reaction of a more noble dip metal. With the more noble metal interacting, certain metal ions are replaced by other ions that have a lower redox potential. The benefit of this approach is that the chemical reaction stops itself, creating a thin and very planar deposition, unlike typical dip coatings. Two other popular methods of plating are related: the electrolytic and electroless. Electroless uses a chemical reaction instead of an electrical current for surface deposition. Unlike immersion plating, electroless is not as dependent on if the copper or the plating source is more base or noble, and it also can provide significantly thicker plating than immersion. Electrolytic plating uses a charge to attract the atoms of plating material onto the board, creating a hard, relatively thick layer. Electrolytic plating, however, requires a location on the board itself to connect a power source in order to properly charge both board and plating material. There are many different types of board finishes, though certain finishes are significantly more popular than others. This popularity, however, can wax and wane quickly depending on environmental and technological requirements, such as the move to lead-free or increasing use of smaller pitch and BGA devices. For example, Hot Air Surface Leveling, or HASL, while popular for years due to its low cost, has seen a steep decline in popularity since the turn of the century because of its use of lead and non-planar surface. A lead-free version has been introduced, which is gaining traction, although it still struggles with providing an ideal surface for smallpitch SMDs. Electroless Nickel Immersion Gold (ENIG), while more expensive, is becoming a popular finish due to its ROHS compliance and extremely flat or planar surface. This finish is ideal for small SMD devices and BGAs and has a great shelf life because the gold layer protects the nickel and copper from corrosion. However, as there are multiple steps in the finishing process and the process uses very expensive gold, this finish is unlikely to significantly decrease in cost even as it increases in popularity. Immersion Tin and Immersion Silver are both great candidates for planar surfaces and are both less expensive. unfriendly process involving carcinogens and other chemicals that people do not typically want to touch. Immersion Silver, on the other hand, is highly resistant to corrosion and has a friendlier process, though its high friction coefficient makes it difficult to use in conjunction with pressfit pins. While it does not corrode, the top layer of the surface does tarnish. Depending on the extent of the tarnish, it may need to be removed before soldering. Organic Solderability Preservative, or OSP, is a leadfree finish that yields great planarity and is extremely thin. While thin, this layer is sufficient to protect the copper from corrosion until soldering. However, OSP is also transparent, which makes it very difficult to inspect. And while the shelf life has been improved in the last few decades, finished boards still typically have a shelf life of less than six months. Finally, while not a finish in the typical understanding of the word, Hard Gold, or Electrolytic Gold finish is commonly used for specific, non-soldering needs. Instead of providing a good soldering point, Hard Gold is a mechanical barrier to protect the copper from corrosion and damage when being used to make contacts such as gold fingers. This finish is extremely expensive, being made of nearly pure gold, and requires special design consideration to provide the connector points for the electroplating process. Finishes are typically the final step of the manufacturing process for PCBs before they’re cleaned and prepped for packaging. While not more important than other design decisions in the process of creating a high quality circuit board, it is not something that should be treated lightly. A proper finish, in conjunction with other design considerations, will make certain that the boards are of the highest quality with the lowest wastage and rework levels.